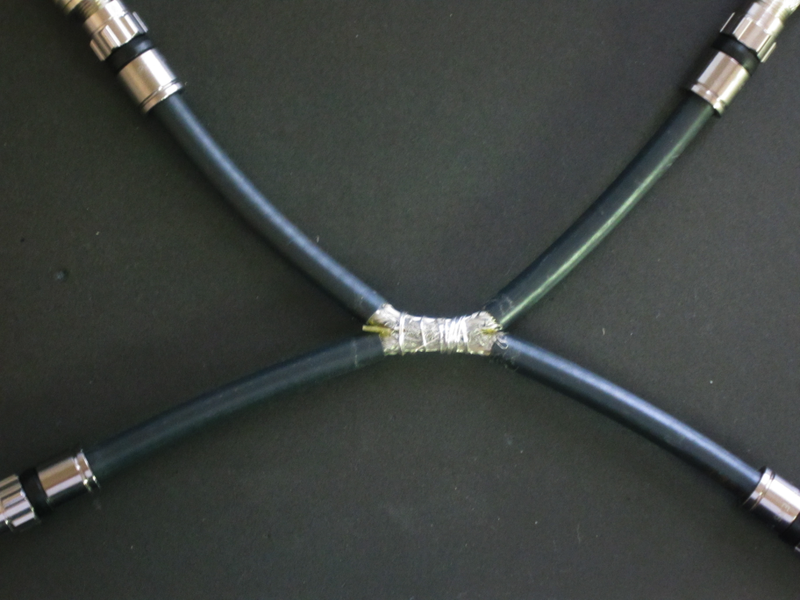 I've been experimenting with a simple directional coupler made from spliced satellite TV coax, which could be used with a suitable signal source to measure antenna SWR / Return loss. In this example the design has been chosen to permit measurement of the SWR of an ADB-S antenna operating at 1090MHz in a 75 Ohm system. For measurements in a 50 Ohm system, 50 Ohm coax and loads should be used. Although it works, I'm not sure that the performance is stable enough to give repeatable results. Two short lengths of 75ohm sat coax. Cut outer insulation away from center of each length of cable for about 1". Cut away 1/2 of braid to expose one side of coax inner on each cable. Slice insulation away to expose inner conductor on each cable. Add thin insulation over inner conductor (I used Kapton tape). Lay the cables next to each other so that the exposed inner conductors are as close as possible. Make sure the inners and braids are not shorting to each other. Lay outer braids over each other and bind together with uninsulated wire. Tape both coaxes together as tightly as possible. Use one coax as main line between RF source and antenna. Use other line as coupler, 75ohm load on coax end nearest RF source, measuring device on end nearest antenna. Leave antenna disconnected and measure RF level as reference. Connect antenna or load and measure new level. Difference in values = return loss = SWR. 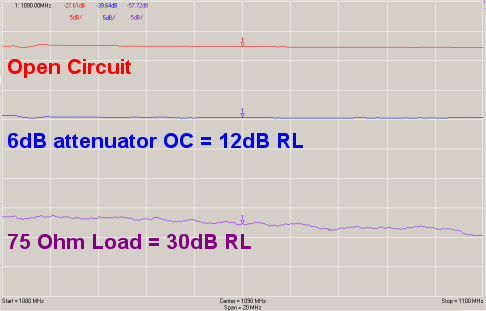 You can test the accuracy of the bridge by connecting a 3dB and / or a 6dB attenuator to the antenna port, leave the other end of the attenuator open or short circuit. As can be seen from the chart shown above, the one I very quickly built had a coupling factor of about -20dB and a directivity of about 30dB at1090MHz. Note that in order to improve the match and directivity I added a 75 Ohm 6dB attenuator between the coupler port and the measuring device. This shows that it is possible to build a very cheap directional coupler, that can be used to make basic SWR measurements, but it's very sensitive to movement as the coax flexes and changes the coupling factor quite dramatically. If it was nailed down, or made from soldered rigid cable it would probably be a lot better.